I’m always looking for fun wedding favors (and cakes) so when I saw a story from HGTV show up in my newsfeed the other day I just had to peek at it! It was a great collection of DIY wedding favors, which are quite popular these days. Thinking back to my own wedding (a long, long time ago) I didn’t do DIY favors but I did make my own centerpieces and that was a lot of work. 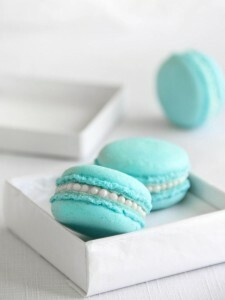 However, these gorgeous macarons would be so worth it! Not only do they cover the “something blue” requirement but they’re almost too pretty to eat. The recipe looks somewhat easy – it could totally be a fun girls’ night in with your bridesmaids. Or hire someone to bake them. Your guests will love these sweet treats! You’ll find the DIY recipe here!